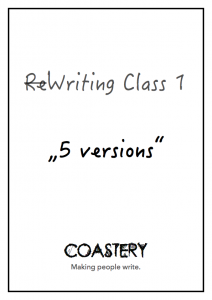 We started Coastery, a company that makes people write. We want to share how it was born. Sometimes it just comes in an unexpected moment but you know you have to start it right now. No waiting time, no more preparation. Just execute, as some people in the inter-webs like to say. 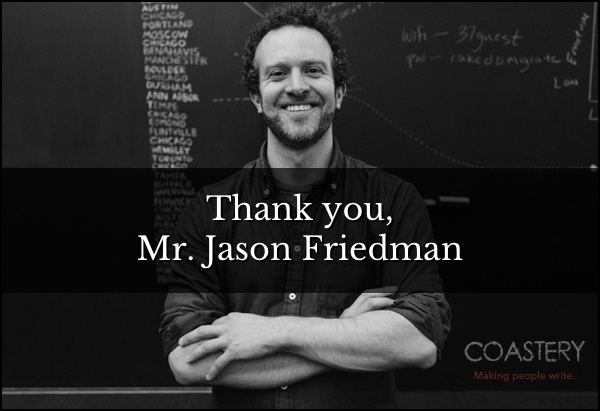 Or read the right message at the right time, like I did when I saw Jason Friedman’s tweet. Thank you for that! His tweet gave the final push for us to go online. So, Coastery is now online, not state-of-the-art but something to get us started in our journey. Coastery is a space motivating people to write — through interactions, interviews and tools. We don’t care where and what you write as long as you write. Not only since Julia Cameron introduced morning pages to a wide audience in her book “The Artist’s Way”, do we know that writing has a big effect on your mental space, your health and capacity to think. You become more productive and focus better. Easy tagline. Expressing a doer mentality. In fact, only taking the time to write serves as a perfect companion to a morning meditation or in the evening or whenever you feel your world is “collapsing” on you. In our childhood we wrote diaries or journals. It’s time to review and re-apply what was good for us when we were young. Because it won’t harm us, it will only give us a better understanding of ourselves. And yes, you may enter very dark corners of your inner spiritual world. Let it happen. It’s important for you whole overall well-being. In every writing assignment you hand in five versions: 3 pages, 1 page, 3 paragraphs, 1 paragraph, 1 sentence. Since Coastery is about making people write we put Friedman’s idea into a hands-on exercise which everyone can participate. Although he ignored my message (reply to his tweet) that we would like to execute it, we just did it. People can request access to our shared Google Document (invitation only) and start writing. However, you will need to be logged in into your Google account to make a request. Feel free to try, write and practice as much as you want. Invite your friends and share it with all people who need that motivation to write or inspiration to move forward in their writing. We’re happy to get your feedback if you like or don’t like particular things. Write us: info@coastery.com. If you liked this article, share the article on Twitter or your preferred network, so other people read it as well.